I have moved to Florida where I plan on continuing with all the fiber arts I have always loved doing. I will continue to teach others all the skills I have developed over my entire life. I can’t remember when I didn’t make toys, sew, knit, crochet and create. I teach in my home in North Port, Florida and I am now also teaching at Searsport Rug Hooking, 31 Chailett Road, Suite #3, Rotonda West, Florida 33947. In the 1990’s I left the corporate world and decided to become serious about having a business doing what I loved. I took many classes to advance my skills. I learned more about Knitting, Crocheting, Heirloom sewing, Smocking, Quilting and discovered Artistry Teddy Bear Making. I became a Certified Spare Bear Parts instructor, selling their products and teaching. I became involved in the Teddy Bear world, designing my own Teddy Bear patterns and I started doing Teddy Bear shows. In 2003 my Teddy Bear studio and classroom was built where for many years I taught and created. In the early 2000 I decided to learn Spinning, Weaving and Rug Hooking. In 2007, I expanded my business by opening a yarn shop on the Granbury, Texas old town square. A few years later I moved my business to the Yeats-Duke Museum, where I became the Curator of the Yeats-Duke Museum for the city of Granbury. At the Yeats-Duke Museum I also demonstrated many fiber related equipment and supplies. I demonstrated and taught spinning, weaving, hooking along with knitting and crocheting. I have retired as Curator of the museum and moved to Florida. I love Florida and continue to teach. My specialty now is making Memory Bears while recycling fur coats. Samples are shown in the Teddy Bear section. 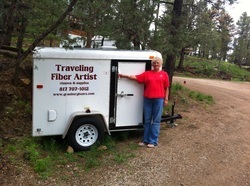 The yarn and supplies are now sold out of the Traveling Fiber Artist trailer- LaBaa Specialty Yarns. Arrangements can be made for the Traveling Fiber Artists and trailer to come to your group.